A unique sales automation tool that offers improvement of the business sales process and customer acquisition and retention. A unique sales automation tool based on SugarCRM, tailor made specifically for the Telecom industry. Offers improvement of the business sales process and customer acquisition and retention. Built on SugarCRM, ITgma's unique Business Sales Automation tool enables fast acquisition and retention of Customers thus offering user friendly environment and faster handling of leads and opportunities. Creates intuitive and customized sales offers with precisely calculated gross margin, combined with dynamic workflows and fast approvals. Delivers better offers much faster than the competition. 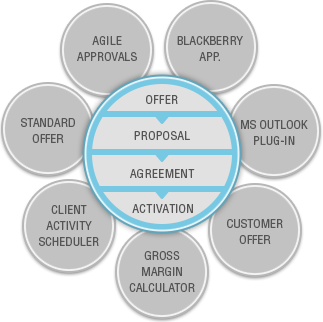 The business sales process is visible at hand with easy to use user interface and one-click away business offers. Saves time, delivers better, offers quality and transparency of information, is customizable for every company and the training is minimal. Gross Margin calculation and approval. Get the brochure for additional information about the feature and implementations of BSA in your company.